Habit at Kula Botanical Garden, Maui, Hawaii. March 07, 2011. 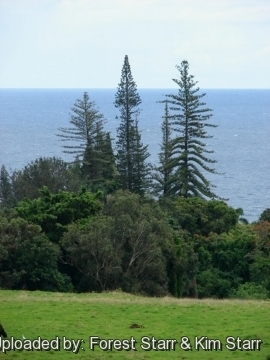 Origin and Habitat: Araucaria heterophylla is endemic to Norfolk Island (Australia) and two nearby islands. On Norfolk Island itself, natural forests are largely restricted to the Mt Pitt (316 m) area of the Norfolk Island National Park. It also occurs on Phillip Island, a 4 km² small island 6 km south of Norfolk Island. There are also historical records of its presence on the tiny limestone islet of Nepean off the south coast of Norfolk Island. Currently there are no Araucarias on this islet. Habitat and Ecology: The original vegetation on Norfolk Island was an evergreen subtropical forest with angiosperm trees and tree ferns 10-20 m high, over which A. heterophylla emerged at least 30 metres and occasionally taller. The really large trees have all been felled, but evidence of trees with a diameter at breast height of around 3 m still existed in the 1920s and large trees have now again reached in excess of 1 m d.b.h. and 35-40 m height. The original forest is now fragmented and very restricted in its distribution on Norfolk Island. Araucaria heterophylla also persists as solitary trees on coastal headlands or in groves with a low undergrowth of mostly grasses or of open scrub, with many introduced species. Logging has been a threat in the past. Land clearance and grazing have also been significant threats in the past but are now less problematic. The impact of introduced invasive species has been significant. This species is now widely cultivated in many parts of the world, particularly coastal areas. Description: Araucaria heterophylla is an evergreen conifer that over time grows to a height of 50 m and 1.25-1.75 m in girth (Trees as tall as 57 m with an 350 cm diameter have been recorded in the past), with straight vertical trunks and symmetrical branches, even in the face of incessant onshore winds that can contort most other species. The crown is conical, almost symmetrical form for the first 40 years or so. When the tree reaches maturity, the shape may become less symmetrical. Female cones are fairly large produced on trees older than 15 years and male cones on trees older than 40 years. Prolific seed fall occurs every 4-5 years and the seeds are nut-like and edible. 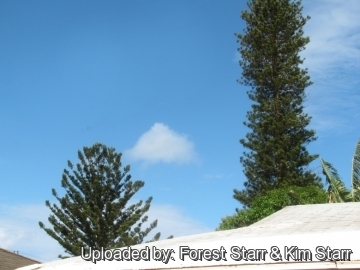 It is sometimes called a star pine, triangle tree or living Christmas tree, due to its symmetrical shape as a sapling, although it is not a true pine. Derivation of specific name: The scientific name heterophylla ("different leaves") derives from the variation in the leaves between young and adult plants. Stem: Trunk straight vertical 1.25-1.75 m in girth, with symmetrical branches. 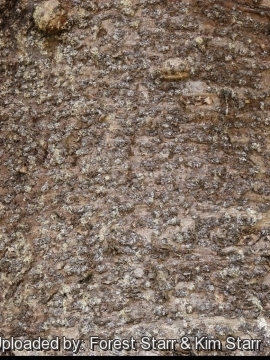 Bark grey-brown, exfoliating in fine scales. Branches in a flat horizontal plane, sometimes pendent, lateral branchlets usually pinnately arranged, drooping. Leaves: Leaves of young trees and lateral branchlets loosely arranged, spreading openly, bright green, glaucous below, awl-shaped, usually laterally depressed, upcurved, 6-12(-15) mm long, about 1 mm thick at the base, and 3- or 4-ridged. Adult leaves scale-like, 2-5 mm long, incurved, densely arranged, bright dark green. On coning branches in the upper crown the leaves are thicker and scale-like, triangular-ovate, densely arranged, overlapping, slightly openly spreading to 6 mm long by 4-9 mm wide, widest at base, curved, midvein obviously raised or not. Male cones: Terminal, solitary or in clusters, elongated, 4 cm. long, yellowish-brown or reddish; microsporophylls acute, margins ciliate, denticulate. Female cones: Subglobose, broader than long, (8-)10-12(-15) cm. long, and (7-)11-14 cm diameter, with triangular scales and a long flattened, acute upcurved bract, and take about 18 months to mature. Seeds: Slightly flattened, 2.5-3 cm long by 1.2 cm. wide, with broad lateral wings. Cotyledons 4, epigeal. 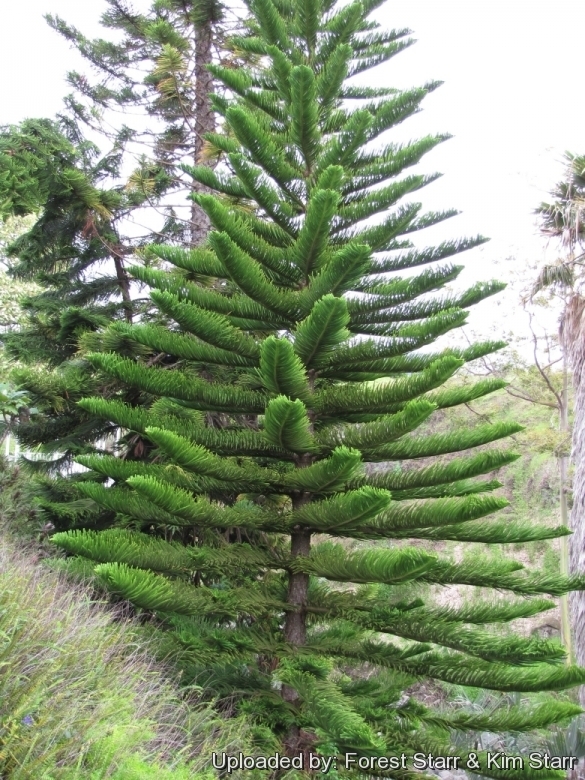 Related species: The Norfolk pine or Araucaria heterophylla, is often confused with the Araucaria columnaris or "candelabra" pine that has a cylindrical profile whereas the Norfolk pine is conical (It does not help that for many decades, the scientific name Araucaria excela was misapplied to the Norfolk Island pine, and it is only more recent gardening books that set the record right by listing Araucaria excelsa as a discarded synonym of the New Caledonian pine.) Adult forms of both these araucarias are not hard to distinguish, but when they are young both species have overlapping, needle-like juvenile foliage that is difficult to tell apart. The overlapping, triangular adult leaves of A. columnaris have a clear midrib which is missing or obscure in A. heterophylla leaves. Moreover the foliage of A. columnaris is more compact, less coarse and a darker green than that of A. heterophylla. Notes: Araucaria heterophylla, is not a pine it is a members of an ancient plant family of conifers named Araucariaceae. During the Jurassic and Cretaceous periods this was an incredibly diverse family of plants, existing nearly worldwide. At the end of the Cretaceous period, dinosaurs became extinct, and so did the Araucariaceae family of plants in the Northern hemisphere. The Araucariaceae continued to thrive in the Southern hemisphere. Within the family are three genera containing a total of 41 species. 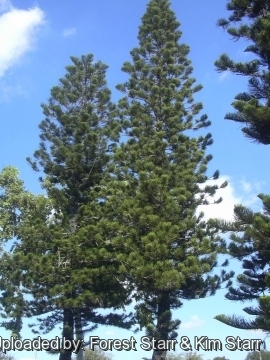 One of these genera is Araucaria, which contains the Norfolk Island pine, Araucaria heterophylla. 1) Wikipedia contributors. "Araucaria heterophylla." Wikipedia, The Free Encyclopedia. Wikipedia, The Free Encyclopedia, 7 Dec. 2014. Web. 16 March 2015. 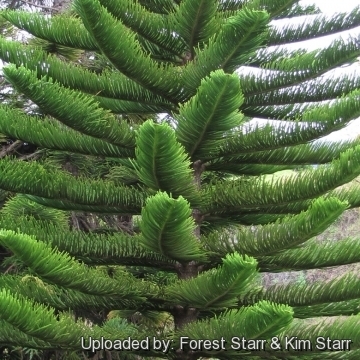 2) Forest & Kim Starr " Araucaria heterophylla (Norfolk pine)". Plants of Hawaii. <http://www.starrenvironmental.com>. Downloaded on 16 March 2015. 3) Thomas, P. 2011. Araucaria heterophylla. The IUCN Red List of Threatened Species. Version 2014.3. <www.iucnredlist.org>. Downloaded on 16 March 2015. 4) Nelson, Jennifer Schultz (31 December 2006). "Norfolk Island Pine". Plant Palette <http://web.extension.illinois.edu/dmp/palette/061231.html> (University of Illinois). Downloaded on 16 March 2015. 7) Christopher J. Earle: Araucaria heterophylla. In: The Gymnosperm Database. www.conifers.org. Web. 15 March 2015. 8) Liguo Fu, Nan Li & Robert R. Mill. : "Araucariaceae in the Flora of China", Volume 4, S. 9: Araucaria heterophylla <http://www.efloras.org> Web. 16 March 2015. Cultivation and Propagation: Araucaria heterophylla is the araucaria most widely used as an ornamental. Young trees are often grown as houseplants in areas where the winters are too cold for them to grow outside, and are sometimes used as Christmas trees. As a landscape tree, they are generally very resilient in the face of high winds near the sea. Soil: It grows well in deep sandy soil, again an advantage in coastal regions. Exposure: House cultivated specimens need as much bright indirect light as you can give them. They can tolerate lower light levels, but need to be acclimated over time to lower levels. Moving a plant from bright light to low light all at once may cause entire branches to die and drop from the plant. Water Requirements: This species prefers humid summers so give regular and abundant water, do not let dry out between waterings, however it does not want to sit in continually wet, mucky soil. The roots and lower trunk can rot if soil is kept too moist. Considering they thrive in sandy soil, which by nature drains well, this is not all that surprising. Aerosol salt tolerance: It is salt tolerant and may be grown near the sea. High salt tolerance can be thought of as a benefit in being grown as a houseplant as well. The Norfolk Island pine should tolerate salt buildup from fertilizers quite well. Wind resistance: It is wind tolerant, but must be protected from drying desert winds. However this conifer look it's best if grown out of the wind. Its tolerance of salt and wind, makes it ideal for coastal situations. Additionally, it is necessary for the species to be grown in oceanic coastal areas, because bodies of fresh water do not provide enough precipitation, moisture, consistent wind levels and saline air, which are all things the species requires. Hardiness:* Hardy to Zone 9 (cold hardiness limit between -6.6°C and -1.1°C). However, they are severely sensitive to frost, and damage caused by frost will weaken the tree, and a tree so weakened will produce multiple weak trunks which cannot tolerate high winds. Garden uses: The distinctive appearance of this tree, with its widely spaced branches and symmetrical, triangular outline, has made it a popular cultivated species, either as a single tree or in avenues. When the tree reaches maturity, the shape may become less symmetrical. It is now distributed extensively across coastal areas of the world in Mediterranean and humid-subtropical climate regions due to its exotic, pleasing appearance and fairly broad climatic adaptability.